Tell us more about webfluenz. webfluenz is a sophisticated social media intelligence system to listen, monitor and engage with social media and the real-time web. webfluenz is a flexible, scalable and detailed social media intelligence system, which uses Natural Language Processing (NLP), semantic search algorithms, advanced data mining and pattern recognition to search through social media platforms to generates some of the most sophisticated insights and actionable real time intelligence. These insights enhance a brand’s ability to create a competitive advantage in the market. 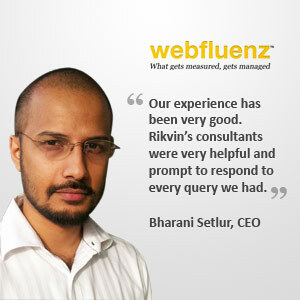 webfluenz consists of a dedicated team of engineers, designers, statisticians as well as market researchers and marketing professionals committed to providing clients with intelligence from the social media and real time web. We decided to set up in Singapore for four main reasons. 1. Singapore has the talent. 3. Singapore is a well-regulated financial center and its banks abide by high safety standards. 4. Singapore is best suited to do business with companies in the Asia Pacific region, which is also our growing customer base. We aim to grow the business across all the individual markets in Asia. Our technology is designed to process multilingual chatter in the social media and the real-time web to produce sophisticated business and market intelligence. Given the diversity of Asian markets especially in terms of languages, this capability has and is giving us a strategic edge. We are constantly rolling out new languages to cover all the markets and give brands an opportunity to engage with their consumers in their own languages. We were recommended to consult Rikvin by our financial advisors. Our experience has been very good. Rikvin’s consultants were very helpful and prompt to respond to every query we had.